For questions regarding the care of a command: delivery, exchange, return, refund, payment methods, please refer to the General Terms and Conditions (or GTC). If you are not satisfied with your pair of shoes you can return it to our manufacture : ZA Lallemande - RN113 30670 Aigues-Vives, by specifying the reason of your exchange or return. You do not have to complete the withdrawal form, just please write the reason of your exchange or return on plain paper. paper and trace around taking your pen well with aplomb. Next, measure the longest. You get such 25cm, your size is 39. Calculation: take your length (eg 25) add 1, the total is 26. Then divide that number (26) 0666. You get 39.04, a size 39. Another example, you measure 27.3cm, your shoe size is: (27.3 + 1) / 0,666 = 42.49, representing a 42.5 size. 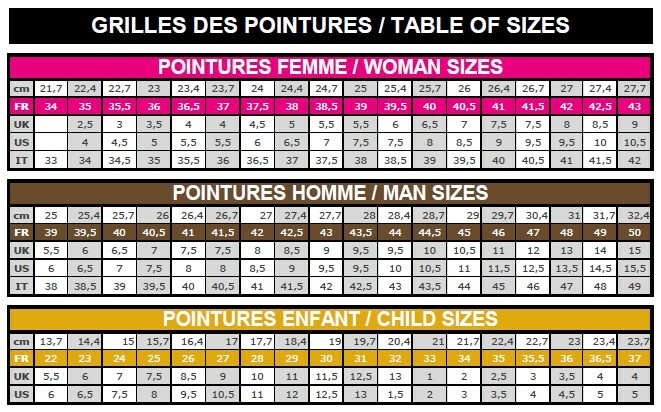 Note that we make semis sizes to realize most of our models. However, you can round the figure obtained in the nearest integer: = 42 to 42.49. Between 2 sizes, the gap is 6.66mm (less than a centimeter), a half-size is 3.33mm. Bespoke: How to take measurements? 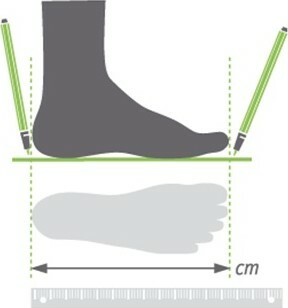 If you want to order custom-made boots, follow the instructions in the diagram against; they will allow you to take with detailed measurements of your calf diameter kick and height. You have to take the measures the circumference of the calf because sitting upright, the stretched leg and the calf can be finer. The circumference should be taken to the place where the calf is the biggest. Consider the boot height: boots if you take 35 cm high, it will not measure the calf circumference above this limit. Extent kick: it is quite difficult to take a position; it is best to tell us, usually with other shoes, you have found that you have a kick late, strong, or normal. If you have questions or concerns, feel free to email us. In the early days of using your pair of boots or ankle boots, you will observe that your heel lifts inside the boot. This transient (about 10 days) is quite normal: the sole is made up of different layers of leather that makes it very rigid. It takes time to "break" the sole and flexible. After this period, the "dé-talonnement" RELIEVING disappears. For the calf, we recommend cleaning the leather with a damp sponge before moving a colorless fat. The "Sapo" is a fat that we do not recommend because it breaks the fibers of the leather to soften; golden calf is already a very soft leather. If there are scratches, a little polish helps make them disappear. Note: after a while, it is possible that a thin white film appears on the calf shoes; this is quite normal: the calf we use is retanned in hot grease and this spring leather to protect it. To remove it, you can either wipe or better, heat (with hairdryer) to get it back into the leather. For oiled butts (dark leather), simply lubricate it regularly with a colorless grease to keep its qualities (sealing, flexibility). For the Camargue croupon - Chair, if any stains, remove with a sponge and soap. Otherwise simply brush the leather with a soft wire brush (brass for example). For suede, it should be waterproofed with a waterproofing spray can. To remove stains, use a suede eraser, sandpaper or fine grain. For calves spangled, star-type gold or taupe space should be waterproofed with a waterproofing spray can. To remove stains, use a stain remover dry type K2r.